Villa Mi Sueno has wonderful sea views plus a large private pool set in a lawned garden - a fabulous setting for a relaxing holiday. This 3 bedroom villa is located inland close to Benalmadena Pueblo with Carvajal Beach, restaurants and other amenities all within a short drive. What's more, the thriving resorts of Benalmadena Costa and Fuengirola, as well as the traditional village of Mijas, are all under 15 minutes' drive away. Air conditioning/heating in the bedrooms and lounge, pool heating and WiFi are included. The views down to the coastline coupled with the large pool and delightful garden. A great holiday escape! The large private pool is surrounded by a lawned garden with plenty of space to relax on one of the sun loungers with a cool drink. What better place to sit back and take in the splendid sea views? To one side there's a covered terrace with a table and chairs for dining alfresco in true Spanish style. Plus, the brick BBQ is great for cooking up your tasty holiday food. There's space for your hire car on the driveway. A pathway leads to the front door, which opens into a small hallway. The accommodation is all on one level. The spacious, open plan lounge/dining room is light and airy with patio doors at one end providing access to an open patio area and at the other end to the covered terrace . It is furnished with comfortable seating, a flat screen TV and feature fireplace, as well as a dining table and chairs to one side. The fully equipped kitchen is adjacent and has access to an adjoining utility room, as well as the garden at the side of the property. Just off the entrance hallway there's 1 twin bedroom with an en suite shower room . The remaining bedrooms, 1 twin bedroom and 1 double bedroom with en suite bathroom , overlook the pool with both having direct access. There's also a separate shower room. This villa has applied for a licence with the Junta de Andalucia and the application number is CTC 2016 161344. The licence number will follow. 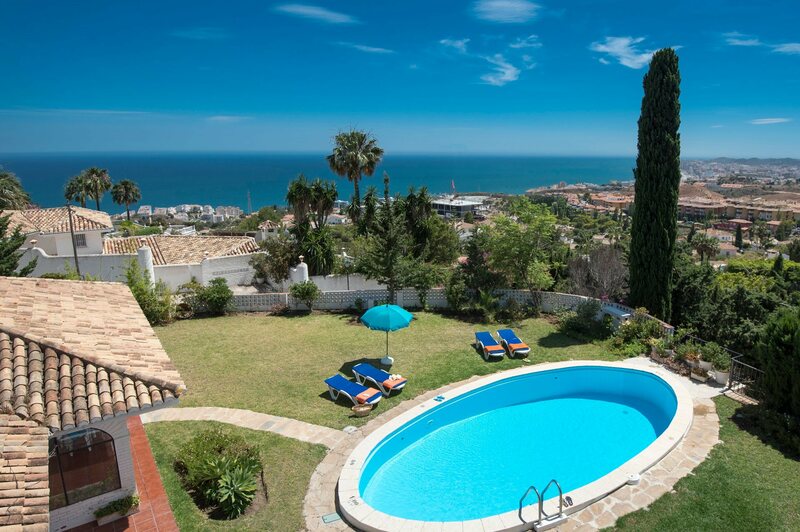 Villa Mi Sueno is located in the residential hillside area of La Capellania, a short drive from Benalmadena Pueblo, and between Fuengirola and Benalmadena Costa. Its elevated position secures views down towards the coast. Carvajal Beach is 5 minutes' drive away which has a selection of restaurants and beach bars. What's more, the picturesque village of Mijas, with its whitewashed houses and wonderful panoramic views, plus the thriving resort of Fuengirola, are also within easy reach. Locally there is a small commercial centre a few minutes' drive from the villa with a mini market and supermarket. A little further on in the Fuengirola area, there is a complete range of larger supermarkets. There will be markets in the surrounding towns of Benalmadena Village and Fuengirola Town, held on different days of the week. In Fuengirola, there are several large shopping centres along with a huge variety of boutique and local shops throughout the narrow streets of the town centre. In the local commercial centre there are several cafe bars and restaurants. Or, the nearby village of Benalmadena has some very popular outdoor terrace bars and restaurants, popular with locals and visitors alike. Alternatively, in Fuengirola and Benalmadena towns there are a wide selection of bars, pubs, cafes and restaurants all along the seafront to suit all tastes and pockets. The nearest beach to the villa is the Carvajal Beach at the entrance to Fuengirola Town. There are areas with chiringuito beach bars and sunbeds available for hire. Or, Benalmadena Costa stretches eastwards along to Torremolinos with several good beaches to try. The extensive area of Benalmadena Costa has a delightful marina offering boat rides and fishing trips. A big favourite in this area is the Fuengirola Bioparc Zoo, a great choice for all the family. In the other direction, located in Arroyo de la Miel, is the famous Tivoli Amusement Park with something to offer all ages. Alternatively, the bustling resort of Fuengirola is a short drive to the west from the villa and has excellent leisure facilities including the Mijas Aquapark, tennis and go-karting. Many visitors to this coast enjoy a day out browsing around the sights of Malaga. A longer journey will take you to the Rock of Gibraltar, great for duty free shopping and a visit to the top of the rock to enjoy the spectacular views towards Africa. Alternatively, another family favourite is a trip to the Caves of Nerja, just over 1 hours' drive from your villa. Torrequebrada Golf is the nearest course to this villa but there are many more with a half hour drive. Villa Mi Sueño is not available to book for season as it is sold out. Take a look here at the Costa del Sol villas that are currently on sale. Located on the N340 coast road on Benalmadena Costa between Fuengirola and Torremolinos, the Torrequebrada Casino is part of the 5* Hotel of the same name. Here, over 18’s can enjoy American Roulette, French Roulette, Black Jack, Punto Banco and Poker. There is also a Slot Machine hall and a classical grill room offering fine Mediterranean cuisine. With a table reservation there is free entrance to the Casino and under the same roof is the Sala Fortuna a popular venue for extravagant international floor shows, flamenco and dancing to live bands. Very nice villa and garden/pool, good views. This was our 2nd holiday to this villa and it was even better this year with the refitted bathroom. Lots of space for 7 people. Nice garden & pool and great view of Fuengirola below. Would definitely stay here again. Overall we loved the Villa and the kids adored the pool. We would certainly come again. This was our first villa holiday and we absolutely loved it. We are a family of 2 adults & 2 children and we had plenty of space. The pool was a great size, pool table & table tennis was handy for keeping children entertained in the evenings. Air-con in bedrooms was very useful at night. Shops 1.1km away, up a steep hill. We would definitely go back to this villa, our rep and the local Villa Plus office were brilliant at dealing with a couple of tiny niggles we had and were knowledgable about the local area when we needed to ask any questions. Beautiful surroundings and comfortable villa. Perfect for our extended family, including a toddler, as there was plenty of space but enough communal space for meals and chilling out. The heated pool was great and the games tables a welcome extra. Our second Villa Plus holiday - excellent property and service from the staff. We will be back! Thank you. All the Villa Plus representatives/employees were extremely professional and helpful. We love the villa for the pool grounds and wonderful location, we feel home from home. The maintenance staff very friendly and extremely helpful. Fantastic holiday would go again tomorrow! !